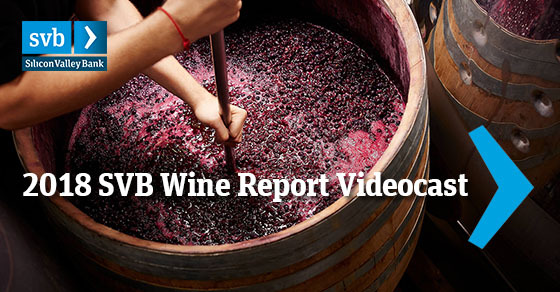 On January 17, 2018, SVB's Wine Division hosted a live wine industry videocast discussion focused on growth trends and predictions for 2018. The discussion was led by Rob McMillan, Founder of SVB's wine practice, and featured industry experts Gretchen Boock, Chief Executive Officer, Dobbes Family Estate / Wines By Joe, Mary Jo Dale, Marketing Director, Americas, Vinventions / Nomacorc and Paul Mabray, Wine Industry Digital Futurist and Director, Getemetry.com. The relationship between increases in wine region tourism and tasting room visitation. Rob McMillan is EVP and Founder of Silicon Valley Bank’s Wine Division based in Saint Helena, California. Starting in 1992, he developed the Division from the idea and start-up phase, to the point where it’s now regarded as the leading and most connected provider of financial services to the US fine wine business. Rob's banking career started in 1981 and he has worked at Silicon Valley Bank since 1990. During that time he has moved though roles of increasing responsibility including a term on Silicon Valley Bank's Managing Committee. Today Rob supports Silicon Valley Bank’s continuing growth and success in the Wine Business by developing new client relationships, as well as speaking, writing, and influencing wine business stakeholders, both in the US and elsewhere. His reputation as a creative problem solver, along with decades of business experience combine to make his time a valued resource with clients and prospects alike. Rob has written and published reports regarding a variety of wine industry topics and trends including the Bank’s highly acclaimed "Annual State of the Wine Industry Report." His views and perspectives on the current condition and future direction of the wine business keep him busy on the West Coast and international speaking circuit. He is widely interviewed and cited in the trade, regional and national media. Rob has been a guest lecturer at several West Coast Universities and in his copious free time he pens opinion pieces on his personal blog - "SVB on Wine." Among other accolades, Rob has twice been named one of the Top 100 Most Influential People in the U.S. Wine Industry; the only banker to make the list. Rob McMillan received a bachelor’s degree in Finance with a minor in economics from Sacramento State University and subsequently earned his MBA from Santa Clara University’s Leavey School of Business. He is affiliated with, and supports numerous charities and industry associations both in and outside the wine industry. Rob has served in a variety of boards over the course of his career in diverse industries, and continues to serve in that capacity today within the wine space. Rob is the father of two, enjoys the outdoors, travel, and takes any opportunity to play percussion and the set in live settings when asked. He won the DCI award as the Nations Best Individual Percussionist in Philadelphia in 1976, but his proudest accomplishment is being the current drummer in the bank's rock band, "The Exploding Warrants."